Manatees and hurricanes were among my first exposure to Florida. This week, the plight of 19 manatees riveted the nation’s eyes on Satellite Beach, as rescuers tried to get them out of a storm drain they had retreated to in search of warm water. As I watched the news, I thought back to my first encounter with the gentle sea cows. It was 1999, and we’d moved to Florida just a few months before Hurricane Floyd was threatening to barrel down our way. Unaware of how much of a problem the hurricane would pose, I decide to spend my day off at Palm Bay’s Turkey Creek Sanctuary. I was alone in the then 107-acre sanctuary. No radio. No phone. I just wanted to get away from it all. For 1 ½ hours, I sat on a bench in a covered bridge scanning the water for just one thing. Then, I saw the form of a golden-brown manatee just beneath the surface of the coffee-colored creek. Once before, on a visit here with my husband, we heard what sounded like a whoosh through the mammal’s blow hole. It was coming from the creek below us where there was algae and leaves. This time, it just glided by. Such a calming creature. It’s affectionately referred to as the “gentle sea cow.” The adults are 10 to 12 feet long, and weigh between 1,500 to 1,800 pounds. So, when I heard that the manatees were in danger this week, I anxiously watched the news. 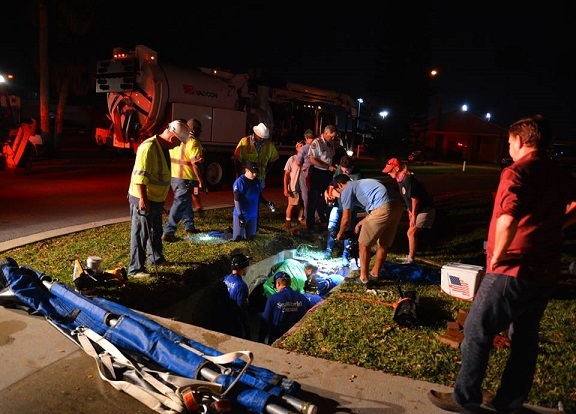 There were 19 of them trapped in a storm drain. They’d gone into that spot in Satellite Beach in search of warm, fresh water. When the temperatures dip below 50, Floridians crab about the bone-chilling cold. But it’s far more serious for the manatees. If it stays cold too long, that poses a serious health threat to the manatees. Water temperatures in the lagoon were pegged as low as 56 degrees Fahrenheit. “Manatees can’t tolerate water less than 68 degrees for a prolonged period of time,” according to a report in Florida Today, a Gannett publication, based in Melbourne, Florida. Usually, the manatees hang out near warm water from power plants. This time, they crowded into a storm drain. Their plight drew national media attention. What seemed ominous at first had a happy ending. 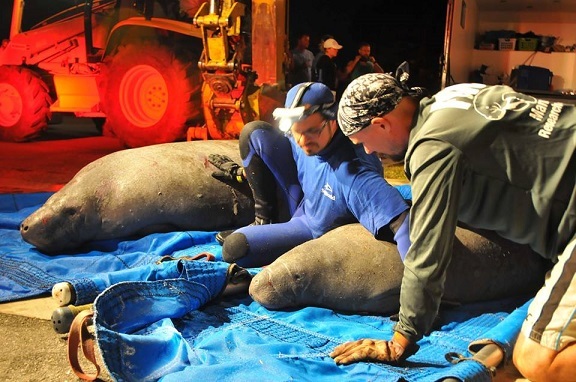 It took a village – literally – to rescue all 19 manatees, thanks to the efforts of workers from Satellite Beach, the Florida Fish and Wildlife Conservation Commission, SeaWorld, police and fire crews. The next time it’s cold, manatees will have to look elsewhere for warmth. That storm drain now has a new grate covering the opening to keep manatees from scooting in there for refuge from the cold. Have you ever seen a manatee in real life? What wildlife have you seen up close and personal? Photo: Rescuers free 19 manatees from a storm drain in Satellite Beach. Photo by Malcolm Denemark of “Florida Today,” a Gannett newspaper based in Melbourne, Florida. Photo: SeaWorld, FWC (Florida Fish and Wildlife Conservation Commission), and animal experts work with police, fire and public works in Satellite Beach to free the manatees. Photo by Malcolm Denemark of Florida Today. So many sea cows get ripped and chopped up by propeller blades. It is so disturbing. They really like to eat lettuce and I always kept some on hand as they passed through the canal at which I lived which lead out to Biscayne Bay and then the ocean. You were lucky to see them so often, Carl. I have to drive about 15 miles to a park and hope that I’ll see them when I get there. Sometimes, I don’t. Boaters are trying to change a law in our area that mandates they slow their boats down in manatee areas. I hope the law stays. what a lovely story of caring and rescue. i’m so happy about the ending. it truly takes a village. Oh no! I’m not sure how I missed this story as I was actually in Florida last week. I am so happy to hear there was a happy ending. It was so cold last week that as we were driving past a bay area, all the little sea birds were huddled together in the tall grasses all puffed up. Probably thinking, like we were, is this Florida? Great post, Judy, I enjoyed learning more about these creatures. Because you know there would be absolutely no sympathy for it, right? Everything being relative, I thought thirty-something degrees in Florida was bone-chilling but would seem like a warm-up here. I saw this when it first appeared on the news. I am always warmed that there are people who care. Damn them boaters anyway! Right, Kate. It’s not like the boaters don’t have the rest of the waterways to raise havoc in. I’ve seen them speeding and know that many just ignore the slow speed signs. Sad. I am so relieved that you told us about the happy ending, Judy. It was truly a special piece here, Judy. I had not heard about this story. I love the movie, “Big Miracle,” which is based on a true story, too. It is about a village and some others who help to get these whales out of trouble, by digging holes in the ice to allow them to come up to breathe. The story made both my Mom and I to weep. It is very nicely done, not given away too much since it is the little pieces that make it all come together. Anyway, the Turkey Creek sanctuary and nature preserve would be a calming place to visit. Such a nice way to share this and let us know about it, too. I was at a restaurant, one time with my family and there was a bay or alcove, where some manatees were restlessly gliding back and forth. I heard it was their mating season which normally they were very gentle and you would barely see the water ripple as they slid past. It was along the Gulf coast, but I was younger, my grandparents lived in Clearwater so were probably south of this area, where there were small coves… I remember the experience but not the location, Judy! Robin … I think everyone breathed a sigh of relief when it all ended well. Turkey Creek Sanctuary is a wonderful place to walk about. We go there several times a year. How lovely that you got to see manatees while dining. They are beautiful. Merril … When I lived in the country, deer would come out of the woods and drink water from the creek on our property. I loved seeing them – except when I’m driving and they are near the edge of the road or dart into the road. Very true, Judy! We’re not really in the country, but my husband had a very close encounter with a deer last night–fortunately it ended well. It’s great when things work out. 😉 Thanks, Dor. I’m so glad this story has a happy ending Judy. < 3 I have never seen one in person, I had no idea they were so big! They are the Mermaids of folklore, are they not? Thanks Judy, so the myth has its roots deep in history! Thanks for the ‘Grit’ source, Rick. Yes, manatees are fascinating. Though they might be happier right now in warmer parts of Florida. When I heard this story on the news this week, it made me smile when there was a happy ending. Honestly, your storytelling was much better than ABC News, Judy. 🙂 Such beautiful creatures. I took a partial news fast this week, so thanks for bringing me up to date with this story. In Jacksonville, years ago manatees became a sort of mascot for the city and painted forms (some whimsical) still be seen all around town reminding us of this precious resource. The gentle sea cows are a treasure. I was eleven when I saw my first manatees, and then for y 12th birthday my aunt sent me a set of blank cards of manatees. I carefully used them only for very special people and the set lasted until 2004! This was a wonderful post, Judy, and it floods me with memories. Isn’t it great when a community pulls together like this and the outcome is a happy one. There should be more news items like this, the world in general might be a happier place. Thanks for posting about the gentle sea cows, Judy. I saw the several tens of seconds they offered the rescue on the nightly news and was glad for their safety. In the early 1990s, I was visiting a friend who had a little house on a channel on a small key a couple up from Key West. I was sitting quietly enjoying being free from the Syracuse winter after dinner, scanning the water, when I saw my first manatee, then my first dozen, swimming right up to where I was sitting. I jumped up and ran into their house to ask about the sea monsters! They laughed and explained all about the docile, warm-water creatures. They’re not very pretty, but they sure were friendly to me that day. It was all over the news, Mark, and I’m glad the outcome was a good one for all concerned. Yes, you are right about the attractiveness relativity factor, Judy. How dare I?! Where we now live in West Wales (U.K.) we live a couple of miles from the coast . We have seen Dolphins playing in the ocean and encouraging their young and we see seals basking on the rocks when we go out on our dingy …it’s amazing . Such amazing creatures aren’t they Judy . Cherry … I’ve seen seals basking on a pier in San Francisco and dolphins leaping in the ocean near where I live. They are beautiful. Judy I love a happy ending, especially when it comes to animals. thanks for sharing this. AS great way to start my monday. It is always heartwarming to see people work hard to save animals. I have never seen a manatee in the wild or otherwise. I have seen dolphins and the Big Five in the wild among others, though. OK, Zambian Lady, what is the Big Five. Elephant and lion, I’m guessing. Rhino? Hippopotamus? What are they? And, how lucky you were to have seen them in the wild. I saw one, once. It was cool, I was really excited to see it. In today’s day and age of media focused negativity- terrorism, climate change, man made disasters and so on, this is such a heart warming and positive story. Almost like a modern day fairy tale with the Manatees ‘living happily ever after’. I’m so glad the ending was a good one. Bless their hearts, I think many of us are searching for warm weather. The wind chill is 11 and falling. It’s a solid rhythm of sleet and freezing rain falling down. The snow arrives soon. I’ve never seen a mantee yet. So thx for this blog post. Nineteen stuck in a storm drain?! That must have been very crowded!!! 😯 Poor things! I have heard of Manatees before but not of storm drains – haha, I don’t think we have such a thing in Britain! Although having said that, some areas could probably do with one – we do have some terrible floods in some areas especially when there’s been a long dry patch in the summer and a weeks rain arrives all at once!! Suzy … I can’t even imagine 19 manatees stuck in a storm drain. They are huge.